I Finally Tracked Down The PC That Taught Me To Love Games. It's Uglier Than I Remembered. This morning on Twitter, a friend linked to a site featuring early advertisements for the personal computer, circa the 1970s. With thirty or forty years of distance, the ads are, of course, dated and even funny, in a way. Just what the hell machine was my first computer, anyway? We got our first home computer in 1985. Like most of the technology we had around in the early-to-mid 1980s, the idea (and possibly the machine itself) came courtesy of my uncle, who at the time worked for Lotus. As a young child who could read very well, but who found handwriting too irritatingly slow for a small child's motor skills, I found the keyboard to be a magically wonderful way of making words. I took to it immediately. It was the machine that introduced me to video games, which I instantly loved. Until today, all I could really remember about it was that it was an Atari computer that we hooked into an amber monitor. My favorite games, which promised on the box that they were "Commodore 64 compatible," ran on cartridges, and we also had a floppy drive, a noisy beast roughly the size of the Oxford English Dictionary. And I remembered one other thing: I had to hold down the "option" key to get the pinball game to start. First things first, then: I decided to track down the system by the games. What pinball was I playing? It launched with a square, circle, and pyramid logo: Electronic Arts. It turned out to be Bill Budge's Pinball Construction Set, which didn't actually narrow it down any. 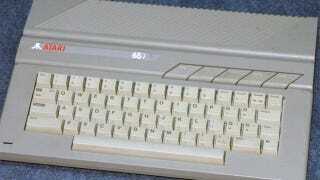 But it did lead me to the Atari 800XL which, while wrong, was close. Remembering that the option key was shaped funny, like a parallelogram, is what finally got me to the right machine: the Atari 65XE. The 65XE, it seems, was an awkward, in-between machine. It was too focused on games to be considered a "serious" computer, and yet too much a computer to be considered a games machine, especially in comparison to the nascent Nintendo Entertainment System. An 8-bit computer launched in 1985, its line was rapidly overshadowed by the evolution of 16-bit machines. In 1988, our family moved on to the world of DOS and dual floppy drives (A and B! Which is why your hard drive is C, kids) with an "IBM-compatible" Franklin and that was the end of the Atari era in our home. But pinball and early, awkward edutainment (by Mercer Mayer, no less!) from an early, awkward home computer introduced me to the world I live in now. Tinka didn't make me any better at math in the long run, but I did master the idea of keyboard control, and the desire to dive into digital worlds. So now, finally, I actually know what my first computer was. Thanks, Atari, for your weird little machine that nobody but my parents seemed to love. You were in the right place at the right time to make me a believer.